There are a number of drivers who never clean their tires. This is what leads to tire blooming. You’ll see cars go by with brown tires instead of black rubber tires. This is a problem due to never cleaning your tires and collecting all types of debris and dust. While some dust is okay, if you live in a muddy area or constantly see your tires are dirty, you are likely causing more damage by not cleaning them. 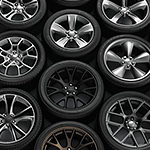 You should clean your tires once per week to ensure that you get all of the dust out. You’ll need to use clean water to rinse off the tires first, then you can apply a tire cleaner to get out other grime and corrosion. Want to get a superior clean every time you wash your car? Try our tips and put your vehicle on a regular cleaning and detailing schedule. Is it Time for a New-to-You Car?